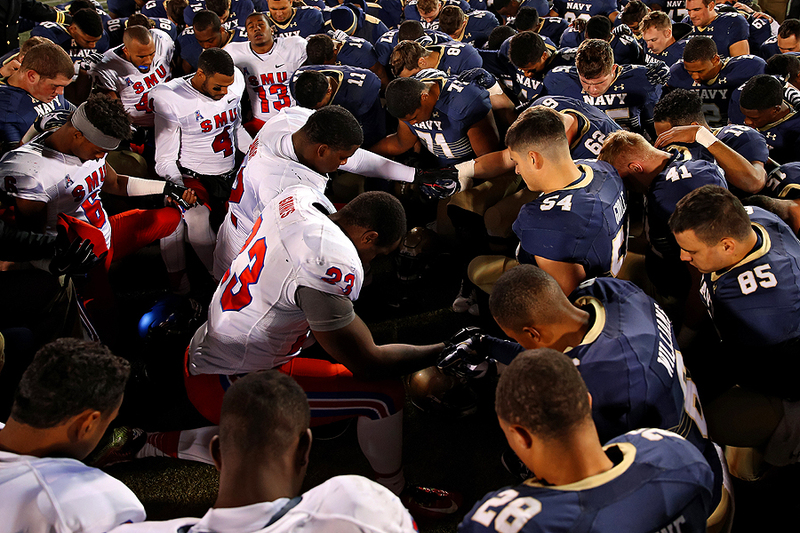 "Ryheem Malone #13 of the Southern Methodist Mustangs lifts his head toward the sky as he and teammates join hands with the Navy Midshipmen in prayer following an American Athletic Conference football game at Navy-Marine Corps Memorial Stadium on November 14, 2015 in Annapolis, Maryland." Everyone has two sides to themselves in some sense. Whether you're acting one way to say, an elder, in comparison to a close friend or in some other form. This idea of having multiple personas is very evident in every day life - and in sports - too. The clearest example would be the above of coming together. Not saying players want to hurt one another, but it's clear that football is a contact sport. And these men go from running on the field full of adrenaline wanting to make a big tackle on a player to the converse at the end of the game - joining hands with said same opponent to pray. With the deadly attacks in Paris, France hours before this football game - and whether these players were praying about others well-being or something else - it's amazing when two large group of men can set aside differences and join hands in peace.